Our Map for hiking and watersports is a must for active travelers. A Hiking Guide, following the example of São Nicolau and São Vicente, is put a on the web. Accommodation you find on our list. Ferries from and to Boa Vista until now are not of sufficient standards for tourists. 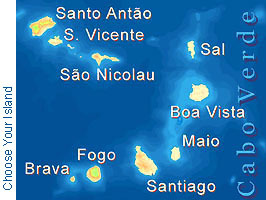 The island is flat, deserted with very little population, concentrating in the little town of Sal Rei and seven tiny villages. 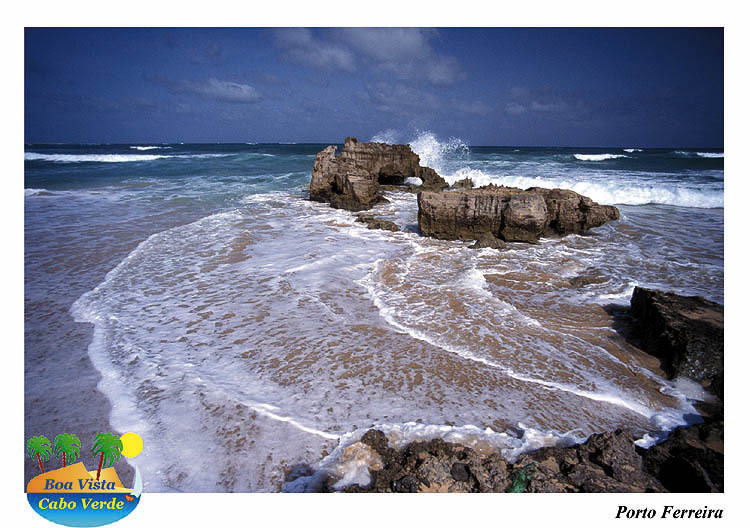 The steady trade winds and its rich under-water landscape made it an El_Dorado for Surfers, Sailors and divers. White sandy beaches stretch over miles and miles where you hardly ever find any other person. Personally, we can't reconfirm the frequently heard opinion that Boa Vista was not the right place for hikers and bikers. Whenever we passed holidays there, the endless beaches and mountainous center of the island seduced us to hikes of up to 30 km a day with incredible landscape motives, especially in the early morning and the last few hours before sunset. What's missing on Boa Vista, is shadow. If you need it, bring it along! And don't forget the strongest sun-glasses, sun-creams, protective lipsticks you can find. The ones for the glacier are the right ones!